It’s spring (ok, four days of sun, we take what we can in the Pacific Northwest). In the spring, I manipulate my hives. At least that’s what I call it. I think the bees think “oh no, she’s messing with our home!” But it needs to be messed with. Bottom screens need cleaning (and weeding at times). Empty bottom boxes need to be move to the top. The brood nest needs to be moved down, so the bees won’t swarm. I try to do this on the first feed of the year. This year, that first feed was done under stormy skies, so I did not want to open hive only to have it rain. Thus, hive manipulation was moved to week number two of feeding, when the sun came out. All my bees are in mediums (aka westerns). So I use more boxes than those folks who keep bees in deeps. Bottom box: is pollen – that’s where the bees put it in fall. That’s where it stays. Collar – a 2 inch high frame the same dimensions as the hive boxes. By April the bottom box is empty. The bees have eaten all their pollen either in the fall or the spring (I don’t ask about the timing, they don’t tell). If I find pollen left, it’s usually a hive with a problem: a failing, or failed queen. When all is right, the queen and brood can be anywhere. Sometimes they’re in the top box. This is worrying, as they’ve eaten all their food. Sometimes they’re in the second or third box. The bottom screen is usually covered with the dead bees of winter. 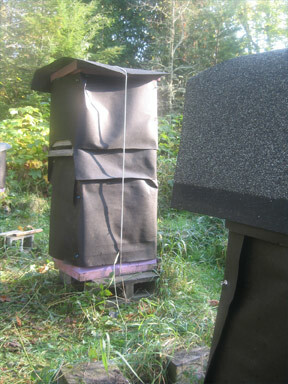 By November it is too cold to break cluster and the bees just drop the dead to the bottom of the hive. These need to be piled up and removed from the bee yard. The bottom screen is cleaned of dead bees and put back in place. Any empty frames that have been in use for five years are removed. Any brood frames that have been in use for three years are removed. These are replaced with either drawn comb or foundation. The empty bottom box is removed. If an empty box is needed on top, it will find a new position there. 1) The bottom screen is cleaned of dead bees, old pollen, and grasses that may have grown through the screen. 2) The box with eggs (and probably the queen) is moved to the bottom. 3) Any box with sealed brood is placed above it. As the brood emerges, this will give the queen room to lay. 5) If the “honey” box is pretty full, and empty box goes on that. If there is no, or very little, honey, the empty box goes above the brood. Folks who over winter in 2 deeps will recognize the system as : put the top box on the bottom, and the bottom box on top. It’s just more complicated with mediums. But I can lift them. The nicest thing is that I can lift them. But there’s another nice aspect if you live in a land of rain, as I do. The lowest box can get manky – damp, even with ventilation and a screened bottom. Wet just gets in everything around here. 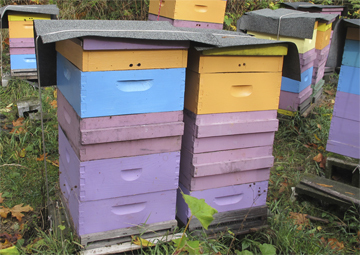 But with a stack of mediums, the bees are far away from the damp lower box by spring. At least mine are. I only have about 50 hives. So that lets me take a good look at my hives in the spring, and I take that time. I check for diseases, for queen laying patterns, the queen’s existence (and if none, eggs are given to the hive), and, of course, stores. It can leave you wondering if you can purchase a new back, but it’s worth the time and effort. I keep notes on everything. I lost 2 hives and one nuc. That’s less than a 5% loss so that’s good. Of course, spring’s around the corner, and this area is hard on bees in the spring. 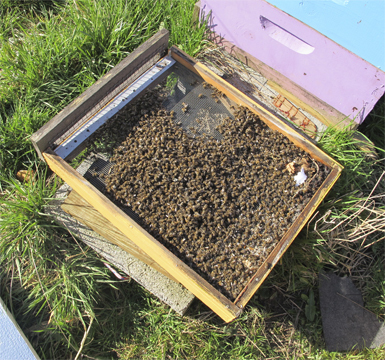 Two hives had brood, but no eggs – either a failing queen or a lost queen. These have been given eggs with which to build new queens. On hive, which was 3 failing hives tossed together with “let the best queen win” came out OK. 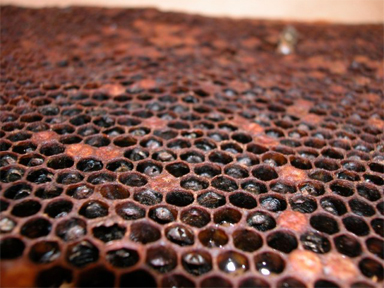 The “best queen” – or most adaptive – and her group moved to one side of the hive and came though the winter just fine. The 2 hives that went down showed failed queens. 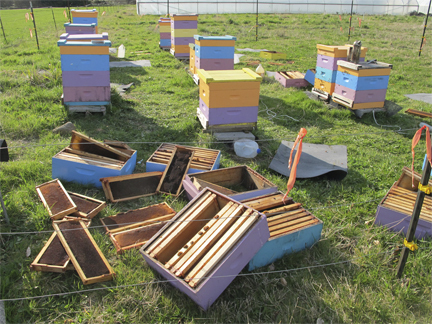 I am suspicious of 3 hives that are doing well – empty frames looked like American foul brood scales. Samples have been sent to the Maryland Bee Lab. But the check this week (the third week) shows no sign of AFB. We shall see…. Report on Winter Experiment : Not Wrapping Hives. This is the first year I have not wrapped my hives in tar paper. Remember, this was a mild year here – it just rained all the time, not much snow after January. The hives STAYED JUST AS DRY OR DRIER WITHOUT THE WRAP. Big letters because I’m so amazed and pleased. I will no longer wrap hives. I will be forever grateful to the Liam (whose last name I cannot remember) of the Mt. Baker Beekeeper Association for gently suggesting I might try not wrapping. It was just fine for the bees, and saved me a lot of work. That’s the news from Brookfield Farm Bees And Honey. How did your bees come though the winter? Any new techniques you tried that worked (or didn’t work)? Beekeeping’s all about sharing and learning. This entry was posted in Beekeeping and tagged bee, Brookfield Farm, cleaning, hives, manipulation, Maple Falls, spring, Washington. Bookmark the permalink.